Vape Box April 2017 – The Goodies Are Here! With several eliquid subscription services, or vape clubs, to choose from, choosing the “right” one used to be difficult. We’ve been, well, unhappy, with some that we’ve tried in the past, so when the opportunity to check out Vape Box came along we were not optimistic. 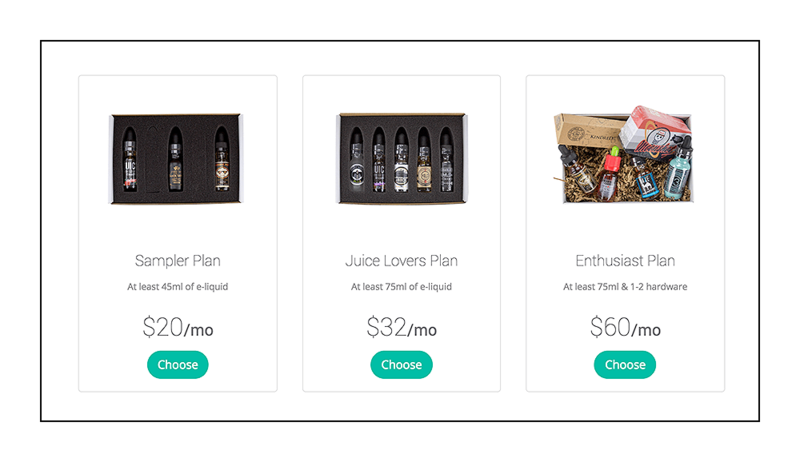 After receiving the first boxes of vape juice from Vape Box, the ‘Eliquid lovers’ plan and the ‘Enthusiasts” plan, not only were we pleasantly surprised, we were elated that there was a subscription service plan for Vapers that actually provided excellent value. 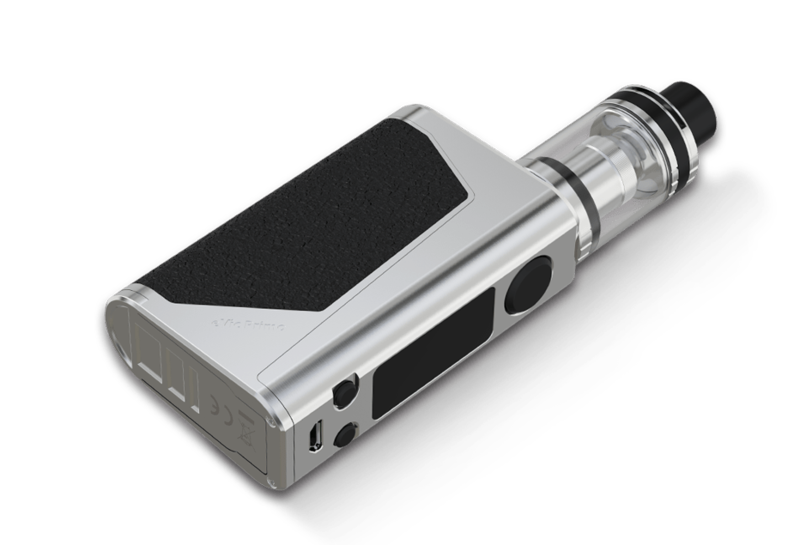 NOTE: For the full rundown on Vape Box, we urge you to read this review. If we simply restate that information here, search engines might consider it ‘duplicate content’ and no one wants that. New boxes began arriving last week, and we’re ready to pass on Michael’s experience with this month’s ‘Enthusiasts” plan. Oh yes, the Subscriber of this Box is Michael, one of our inner staffers who usually keeps a low profile, since 2012. This review was done in the form of an interview, asking Michael what he thought of the vape juice and eVic Primo, inside this month’s package, and written by me, Dave. Michael’s flavor profile was for the sweeter things in life, and 3mg of nicotine. The following eliquids were chosen for Michael by Vape Box curators, based on the profile card he filled out when he signed up. 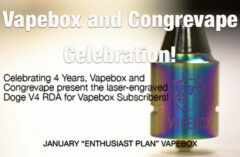 The Enthusiasts Plan is $60 a month, $66.00 for USPS Priority shipping. 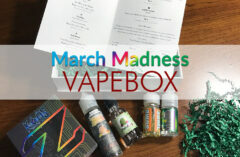 Every month the subscriber receives a custom curated box based on their chosen flavor profiles (which the subscriber can change whenever they want), and along with at least 75mL of eliquid the subscriber receives, one of two pieces of vape gear is included as well. 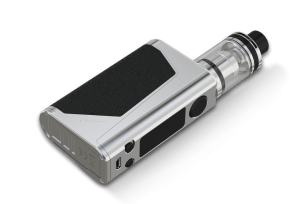 Read our review for the eVic Primo by Joyetech here. Kilo is one of our favorite vape juice brands, particularly their Black and White uber-premium labels. 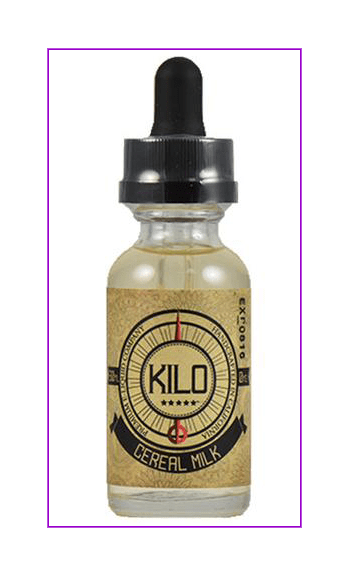 Cereal Milk is one of Kilo’s top selling flavors, with a creamy/milky base flavor and genuine kid’s cereal sweet notes. This bottle of Cereal Milk was devoured by Michael in 2 days. Asked if this would become a regular for him, Michael replied, “I’d like it to, but I’ll need a few more bottles to decide”. Yep, that’s Michael, always making careful decisions on where his money is spent. The perfect vape juice subscription customer. 2 – SELFIE SUNDAY by 7 DAZE – “A crisp sweet red apple. The best apple packed in a bottle just like delicious apple juice. This blend is 60% VG. Selfie Sunday is one of the top selling flavors by 7 Daze. While the official description says, this flavor is a “crisp” and sweet red apple, Michael found it to be more of a sweet red apple, the best kind. Although this blend is 60% VG, vaping it in a SMOK TFV8 Big Baby sub-ohm tank produced wicked clouds of vapor, permeated with the aroma of red delicious apples. Michael says the flavor is out of this world, and for Vapers looking for an Apple flavor to vape, this is right up there. 3 – FURY by ANML – Fury delivers a spot-on rendition of sugary cereal with a splash of premium whole milk, creating a remarkably indulgent vape experience that is full-bodied and delicious on the inhale and yet crisp on the exhale. The official description here pretty much says it all, according to Michael. This was his favorite of the bunch, sweet and full-bodied, tons of vapor and tons of flavor. The makers of Fury and the rest of the ANML lineup have long pedigrees in the mixing and creation of some of the most popular lines of eliquids. This one, Michael told me, was definitely a keeper. Phillip Rocke Signature Series – Rainbow Rocks – 80% VG – Phillip Rocke’s latest creation – an ultra-accurate, complex yet lighthearted rainbow-colored candy vape that will satisfy the sweet tooth of every red-blooded American. Another deliciously sweet concoction by Phillip Rocke, this one is for the sweet-tooth Vapers that can’t get enough clouds or sweets. Michael loves the Unicorn bottle and prefers all his eliquids come this way. If they don’t, he pours the contents of the bottle into one of his own Unicorn bottles. The 80% VG was right up Michaels ally, as a cloud chaser this level of VG is going to send huge clouds out from his TFV12 Cloud Beast King at 140W. The flavor is pure candy, but when asked to define the individual “rainbows” of flavor, Michael couldn’t identify them, saying only that the blend was ‘delicious and addicting’. This was Michael’s first box from Vape Box and he was more than thrilled with its contents. In fact, for the $60 cost of this plan, Michael wanted to know if it was possible to get a new box every week. It’s not, but he’d do it if he could. If you’re interested in signing up for a subscription that has real value, premium retail bottles of vape juice, look for the Vape Box Ad on our sidebar for 10% off your subscription.